Today was spent with more blackjack and bumming around Vegas. 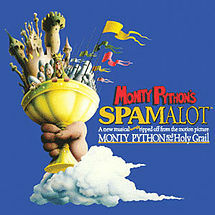 In the evening, we all went and saw Monty Python's Spamalot, which I've been dying to see since it opened on Broadway and now also has a permanent show at the Wynn. We all thought it was awesome! Afterwards, we headed back downtown where our evening consisted of more blackjack and drinking booze from accurately-sized plastic footballs.